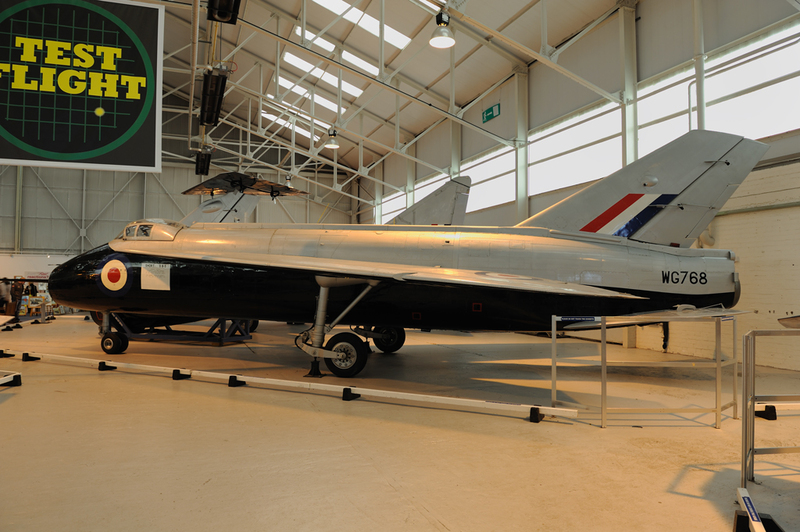 The English Electric Lightning was the last all British designed and built supersonic fighter. Retired from front line service in 1988, the aircraft can still conjure up a misty eye among those with an interest in aviation history. So where did all it begin for this British icon ? Well the concept of an aircraft that could take off, reach a great height and deliver a knock out punch first appeared in the latter years of the Second World War in the form of the Messerschmitt Me163 Komet. A few years on, the Lightning achieved much the same result. At the wars end the Royal Air Force had two jet fighters in production these being the Gloster Meteor and the De Havilland Vampire. Both types formed the genesis of jet aviation but were limited in potential development. Enter the Hawker Hunter which gave the RAF a quantum leap forwards with regards to aircraft design and capability. The age of jet propulsion was moving forwards rapidly especially as more was being understood about passing through the sound barrier. The race for greater speed was on and a rare breed of very brave test pilots reached towards the new frontiers of high speed flight. Whilst the quest for speed was ongoing, political thinking was going down another route. This route was that the age of the manned fighter was coming to an end. The idea was that future air wars could be fought using surface to air missiles. Time and hindsight have shown this doctrine to be flawed and the manned fighter remains to this day. 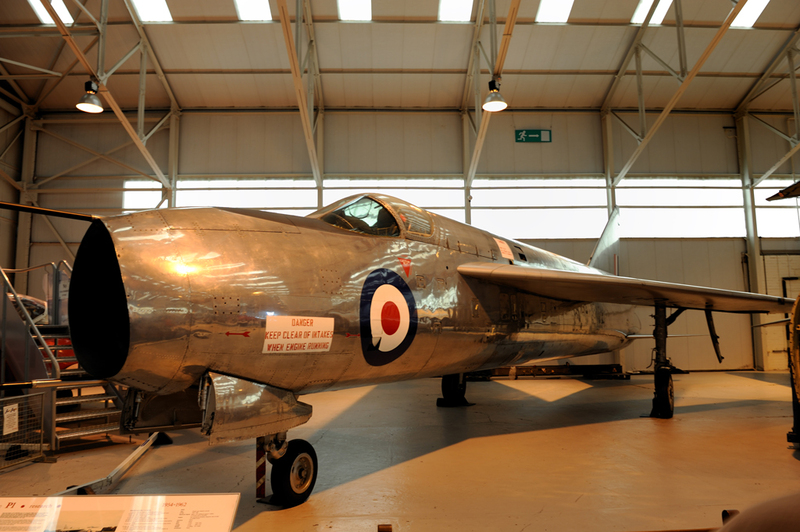 Luckily the Lightning just managed to escape cancellation in the 1957 White Paper and was developed into the much loved fighter we know today. In May 1947 Specification E.R.103 called for a manned supersonic research aircraft. English Electric responded with the P.1 designed initially by W.E.W. “Teddy” Petter. There was also input to the Lightning’s design by Roly Beamont who had had experience flying the F.86 Sabre. Design performance had been set to a maximum speed of Mach 1.5 at a height of 30,000’. Work at Warton was rewarded in April 1950 when an order for three aircraft under Air Ministry Requirement F.23/49 was placed. The requirement differed from E.R.103 in that the design had to incorporate military capabilities. At the time the Royal Aircraft Establishment (RAE) expressed concern over the design of the P.1 especially the high mounted “T” tail. The design of the P.1 was unorthodox to say the least. Two engines were mounted on top of each other, the upper engine being mounted slightly more forwards than the lower. The P.1 was a very advanced design but with concerns over the arrangement of the tailplane it was decided that there was no room for guesswork. It was decided that a slow speed trial aircraft be constructed so as to test the two tailplane arrangements. Short Brothers were entrusted by the Ministry Of Supply (MOS) to construct such an aircraft. This was designated the S.B.5 and first flew on 2nd December 1952. The aircraft had an interchangeable tail arrangement and the wings could be adjusted 50, 60 or 69 degrees on the ground. Testing showed that wing drop was evident but this was attributed to manually operated ailerons. Problems with asymmetric airflow break-down, that is associated with highly swept wings, was overcome by incorporating a wing notch into the leading edge of the wing. This can be seen on subsequent production Lightnings. Petter moved from English Electric to Folland and design work on the P.1 was taken over by Frederick W. Page. Things moved on apace and before flight testing of the S.B.5 had been completed, Page convinced the MOS to approve further research and and allow construction of P.1.A, WG760. Taxiing trials commenced in July 1954 after which the aircraft was transported from Preston to Boscombe Down to the A&AEE. On 4th August 1954 WG760 took to the air in the hands of Wing Commander Roland (Roly) Beamont. The aircraft reached a height of 15,000’ and attained a speed of Mach 0.85 before landing 30 minutes later. The first time a time a British aircraft was to go supersonic in level flight was a week later on 11 August. WG760 went transonic at 30,000’ but the event went unrecorded as the flight was too short. On 12 August Beamont took the aircraft to 38,000’ and recorded a speed of Mach 1.02. The transition was so smooth it went unnoticed, the aircraft continued to respond in a normal manner with no apparent difficulty. A second aircraft, WG765, was retained by its manufacturer for static test purposes whilst a third, WG763, joined the flight test programme on the 18th July 1955 and became the second prototype. WG763 had a ventral 250 gallon fuel tank fitted along with tow 30mm Aden cannons. Flight testing provided valuable information that led to a number of modifications to the airframes. In September 1955, Beamont flew WG763 at the SBAC show at Farnborough. The aircraft provoked much comment and debate in its unusual design and lay out. The next step was to evolve the P.1.A into an operational fighter. From here evolved the operational prototypes in the form of three aircraft under the designation P.1.B. The aircraft were serialled XA847, 853 & 856. It was planned that the prototypes would carry cannons, two missiles and forty eight two inch rockets. The two engines were changed to Rolls Royce Avon’s which increased thrust by 70%. The nose intake design changed from pear shaped to round. In the centre of the intake, a shock cone for high pressure ducting was fitted. This served also as a housing for a Ferranti AIRPASS (AI.23) fire control radar. The AIRPASS radar was developed by Ferranti using a former RAF Dakota with a nose mounted AI.23. The aircraft's cockpit was modified to incorporate all the instruments associated with the radar including the display, hand controller and attack sight. The AIRPASS system went on to become the first monopulse radar system to achieve frontline service. Visibility from the cockpit was improved by the raising of the pilots ejection seat, this required that the canopy be faired into a fuselage central spine. The spine also housed the Plessey starter system, tanks and pumps. Design changes also took place to the air brakes, flaps and the nose wheel was also reworked so that it retracted forwards as opposed to the turning through 90 degrees as on the P.1.A’s. The maiden flight of a P.1.B took place on 4 April 1957. The aircraft behaved exceptionally well and reached Mach 1.2 with ease. Further trials were undertaken at A&AEE with regards to aerodynamics and reheat which led on 25 November to XA847 achieving Mach 2. In November 1956, fifty examples were ordered, twenty of which were to be built as pre production models. Serial numbered XG307 – XG313, XG325 – XG337. These pre production models featured an AIRPASS radar, twin 30mm cannons and missile pylons to take De Havilland Firestreak missiles. Power was provided by a pair of Rolls Royce Avon 201’s producing 14,430lbs of thrust. Fuel load amounted to 7,500Ibs which allowed the aircraft to take off on full reheat, reach 30,000’ and effect a single pass interception at Mach 1.5. This would leave 1,600Ibs of fuel on return to base or allow for a diversion to an alternate airfield. The fourth aircraft featured a 30% in fin area which was required due to instability that was encountered when firing Firestreak missiles. The final three aircraft in the batch had more fuel capacity reaching nearly that of the production aircraft. XG307 made its first flight from Samlesbury on 3 April 1958 in the hands of Roly Beamont. Firestreak and Red Top missile trials were undertaken by British Aircraft Corporation (BAC) mostly using XG332. Hot weather trials were undertaken using XG333 which had been shipped to Khormaksar in July 1961 for the purpose. By this time a unit was set up that was known as A Squadron at A&AEE, which incorporated most of these aircraft. XG334, 335 & 336 were allocated to the Air Fighting Development Squadron (AFDS) at Coltishall towards the end of 1959 for service trials. 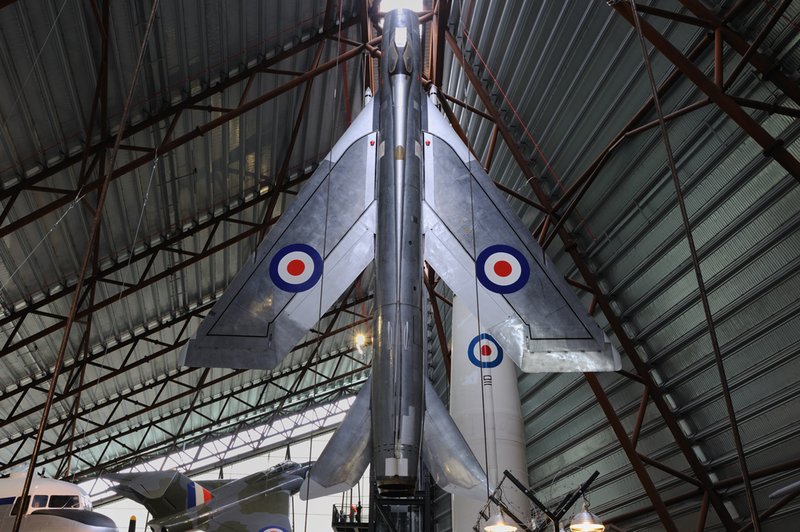 The Lightning finally received its official name on 23 October 1958 at a ceremony which was held at Farnborough.